← What will Pluto look like? When NASA’s Dawn spacecraft is captured into orbit around the dwarf planet Ceres on Friday, March 6, there will be no fanfare in mission control. In fact, the spacecraft won’t even be in radio contact. There’s no need, because Dawn’s path is set – this is a spacecraft unlike any other. What makes Dawn unique is its ion propulsion system, which gives the spacecraft incredible manoeuvrability. Instead of using large bursts of thrust to get where it’s going, Dawn takes the slow and steady approach. Its ion engine delivers a tiny but continuous thrust that can last for days or weeks at a time. Over the last two-and-a-half years, Dawn has been slowly reshaping its trajectory to bring it near Ceres and, most importantly, to match the dwarf planet’s speed – Ceres travels around the sun at nearly 64,000 kilometres per hour. For other planetary missions, entering orbit is make or break. It’s an intense moment that hopefully ends in jubilant celebration when all goes as planned and the spacecraft momentously falls into orbit. But Dawn’s slow approach means that it is now right on course to guarantee capture by Ceres’ gravity. Come Friday, if the spacecraft’s propulsion were to be switched off it would remain under Ceres’ influence but would travel around the dwarf planet in a highly elliptical orbit. 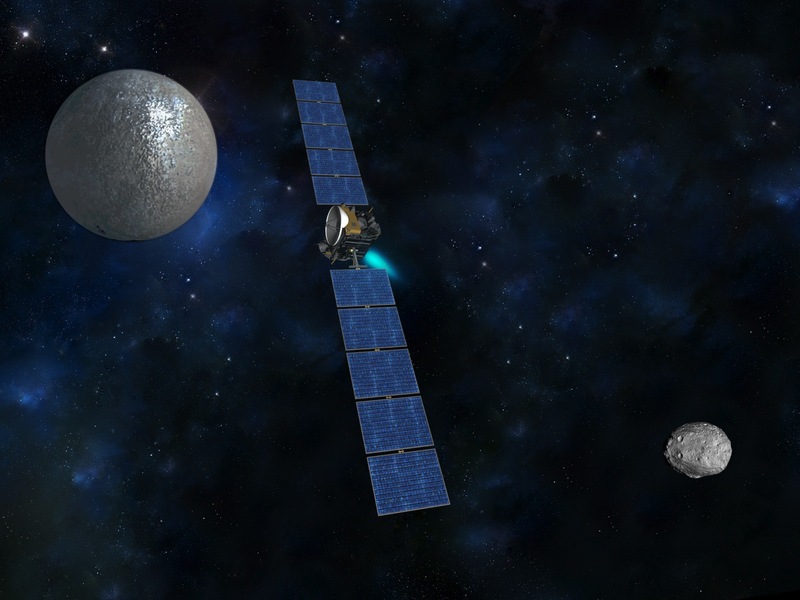 So over the next few weeks, Dawn will use its ion thrusters, together with Ceres’ gravity, to slowly draw it into a circular orbit – the first of four such orbital positions around the dwarf planet. 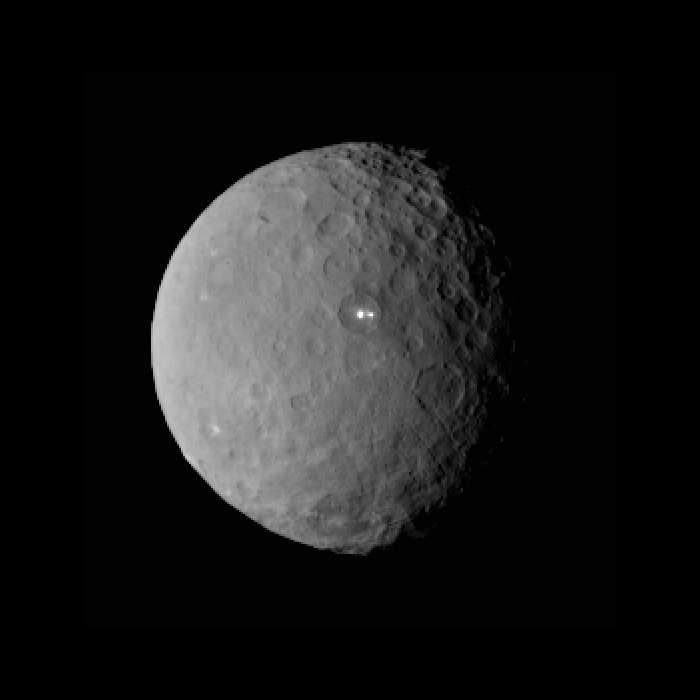 Ceres, is the second object that Dawn has orbited. 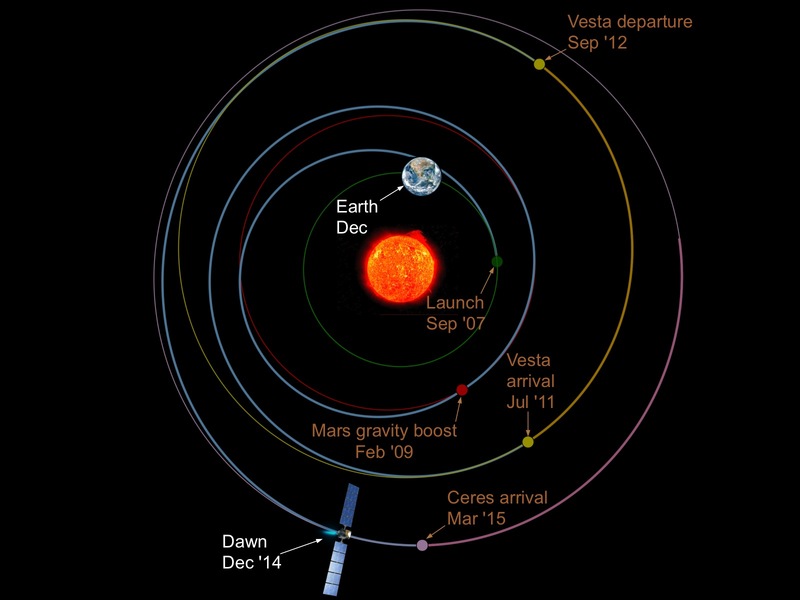 Between July 2011 and September 2012, Dawn was in orbit around Vesta, which like Ceres, resides in the Asteroid Belt located between Mars and Jupiter. This marks the first time that one spacecraft has been able to orbit two different planetary objects. And it’s only possible because of Dawn’s ion engine. A spacecraft powered in the usual way using chemical propellant, would require ridiculous amounts of fuel to carry out such a mission. And even if it was possible for a spacecraft to carry that much fuel on-board, the cost of the mission would be astronomical. 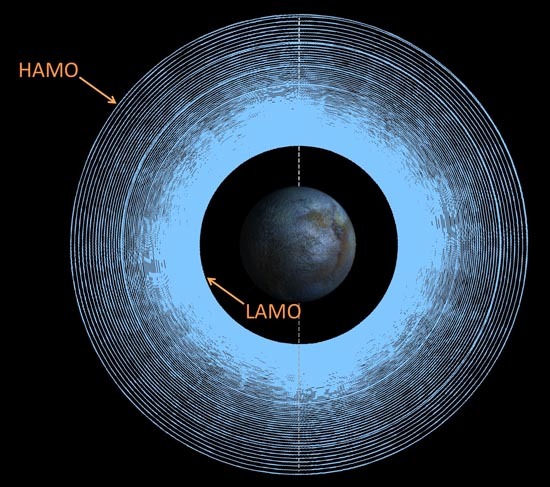 At Ceres, Dawn will eventually travel in a polar orbit, travelling above the north and south poles. As it moves from north to south it will travel over the daytime side of the planet, and then during the second half of its orbit it will fly above Ceres’ night side. In its first orbital position, at a height of 13,500km, it will take 15 days for Dawn to complete one orbit. Since the planet takes only nine hours to rotate on its axis, this will allow Dawn to make a good map of the dwarf planet’s surface. Throughout its 15-month mission, Dawn will vary its orbit three times each one descending closer to the planet at heights of 4,400 km, 1,470 km and 375 km. To change orbits it will move through a complex series of spiral trajectories. The descent to its lowest orbit will take two months and during that time Dawn will complete 160 revolutions as it constantly reorientates itself to ensure that one of its ion beams is thrusting in the right direction to continue its slow spiral descent. Ion propulsion systems, like the one that powers the Dawn spacecraft, have long been considered the next big thing for space exploration. In fact, they seemed so futuristic that they appeared in the Star Wars movies powering Darth Vader’s TIE fighters or Twin Ion Engine fighters. Ion engines were first used by NASA on Deep Space 1, which flew past the asteroid 9969 Braille in 1999 and comet Borrelly in 2001. The Japanese Aerospace Exploration Agency (JAXA) has successfully used ion engines on its Hayabusa asteroid missions, the second of which was launched in December last year. The Dawn spacecraft is fitted with three ion engines, although only one engine is used at any one time. 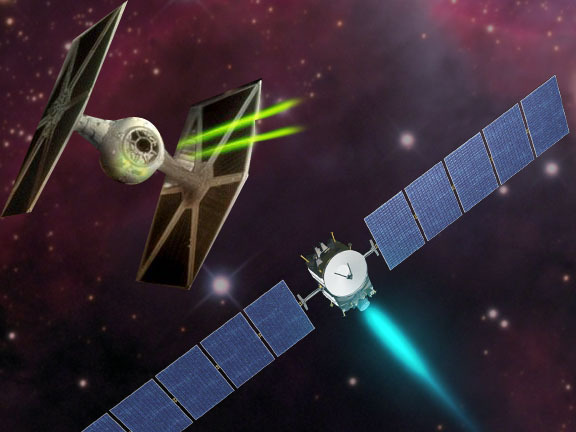 And true to what we expect from science fiction, the spacecraft does emit a blue-green glow. This is a result of its xenon fuel. Positively-charged xenon ions pass through two electrically charged grids. This accelerates the tiny ions and they shoot out of the engine at 144,000 kilometres per hour, providing the thrust to propel the spacecraft in the opposite direction. Ion engines are around ten times more efficient than chemical rockets because the ions are ejected at roughly ten times the speed that a propellant is expelled by a rocket. But the acceleration is much slower. It would take Dawn around four days to accelerate from 0 to 100 kilometres per hour but the trade off, is that in doing so, it would only use 450grams (or just one pound) of fuel. Of course, the reason the technology is so marvellous is because it enables such fantastic science – the exploration of the two most massive objects in the asteroid belt, Ceres and Vesta. Don’t let their location fool you, these are not space rocks like typical asteroids. 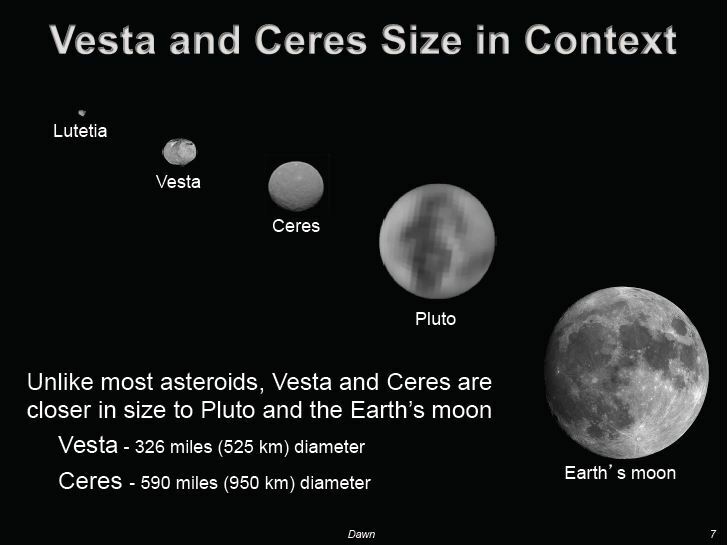 They are big worlds and like Earth and the other terrestrial planets, Ceres and Vesta have a layered structure. Vesta has an iron-rich core, a silicate mantle and a crust made of basalt. While Ceres is thought to have a rocky core, an ice mantle and a dusty surface. The ice mantle is particularly interesting. It’s thought that around 30% of Ceres’ mass may come from water and potentially some fraction of that could be liquid water. Just last year, the Herschel Space Observatory made detections of what appear to be plumes of water vapour, escaping from slightly warmer regions on Ceres. The Dawn mission will continue until June 2016 and the latest images will be regularly posted here, while the Dawn mission blog is a great way to keep up-to-date on everything that happens. The space mission was called Dawn because if we think of Ceres and Vesta as protoplanets, then by better understanding these objects, we will gain insight into the early history of our solar system. The planets of our solar system formed by a method of accretion. 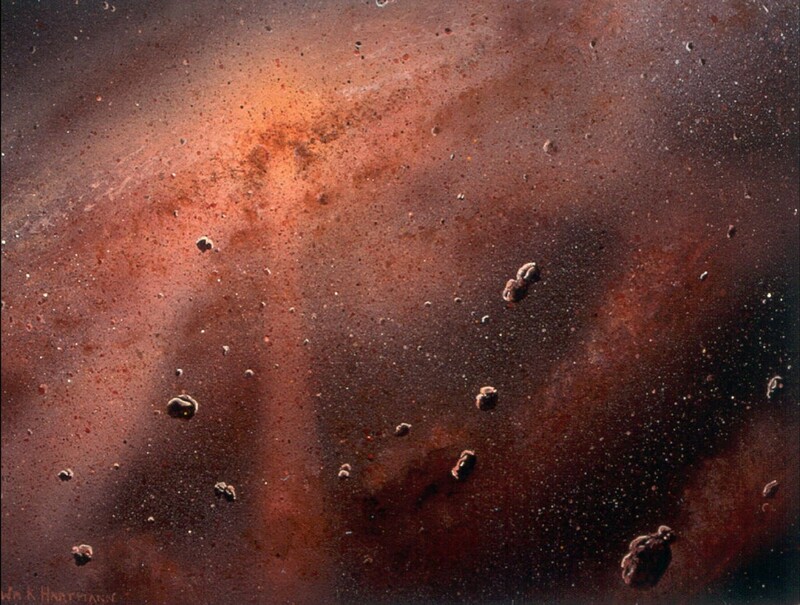 Starting out as specks of dust that collided and stuck together, they then grew bigger and formed rocks until eventually they were large enough to draw in enough material to form planets. Vesta and Ceres seemed to have halted mid-way through this process. This is most likely due to the formation of Jupiter and its gravity may have prevented objects in the asteroid belt from coming together to finish off the planet building. As a result, Vesta and Ceres provide a unique opportunity for understanding the early formation of the planets because they came so close to becoming one themselves. This entry was posted in Uncategorized and tagged Ceres, Dawn mission, dwarf planet, Solar System, space exploration. Bookmark the permalink.